Will it be man versus machine? Q In Singapore we have been trying to raise productivity levels and we now have a big opportunity with automation, robots and artificial intelligence. A Boston Consulting Group study posits that by 2025, a quarter of jobs will be replaced by smart software or robots. An Oxford University study says 35 per cent of jobs in Britain will go the same way. We have robots writing poetry now. How will automation change jobs and manpower in 2030? LEGRAND I was recently sitting on a panel about artificial intelligence and one of the co-panellists said he thinks more about augmented intelligence. If you pit man against machine in a chess game, the machine starts to win most of the time. But if you do man-plus-machine versus machine, man-plus-machine will always win. So it's going to be about being one of those humans who know how to work with the machine to deliver a stronger throughput - faster, smarter and more efficient. So I like this idea, rather than the rise of the bots and the fact that we're all going to disappear and they are going to take control of our planet. I like this idea of augmented intelligence and how man-plus-machine can create incredible things. TOH When I, as a manpower reporter, talk to workers, the fear of losing their jobs and being replaced by robots is very real. Taxi drivers are worried about being replaced by Uber, and Uber drivers are worried about driverless cars. But you can't automate everything. You can't automate the physiotherapist helping the elderly patient exercise. 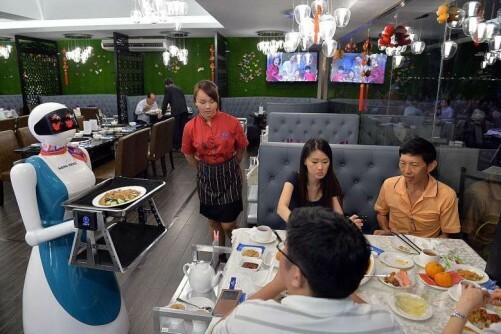 You can't automate some retail and F&B services, where you need to take the food to the table. So I think there is a balance that companies have to find - how much to automate, how much not to. BOEY Look at our clerical staff or even the profession that I'm in, whether it's tax associates or the audit associates. If you're spending a lot of time doing data collection and consolidation, you almost know that that's a job that's going to go with automation. So then don't spend too much time manipulating the data, but on thinking about the insights that you get from the data. How do I focus on the more value-added part of the work - that's one change the individuals need to make. TOH I'm quite uncomfortable with the kind of fear that you might put in workers, that they may be replaced. I don't think the threat is overstated, but the debate lacks some precision. What will be useful is an assessment of what kinds of machines will replace what kinds of workers, and to what extent. It's very clear to me that eventually, humans will be replaced because 10 years ago, we laughed at the automatic translation, but now it's almost 100 per cent precise. I think that's a little bit oversold.